Continuing with my March theme of birds, I remembered this fun book we discussed when I was one of the judges for the 2015 Cybils Awards for fiction picture books. Hoot Owl is no ordinary owl. He is a master of disguise! In the blackness of night, he’s preparing to swoop on his prey before it can realize his dastardly tricks. Look there—a tasty rabbit for him to eat! Hoot Owl readies his costume, disguising himself as . . . a carrot! Then he waits. The rabbit runs off. Never mind! Surely his next juicy target will cower against such a clever and dangerous creature as he! 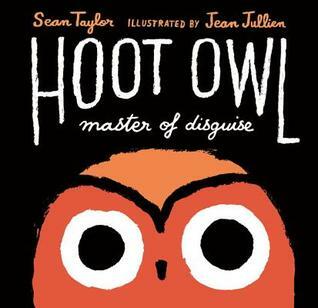 Hoot Owl, Master of Disguise was written by Sean Taylor and illustrated by Jean Jullien. The copy at my library was published in 2015 by Candlewick Press. This is an excellent example of a book with a short text and a main character with lots of voice and personality. This story has a repetitive pattern, lovely creative language and it’s funny! I recommend it as a book that picture book writers should take a look at, especially if you are writing a story told in first person. I also really liked the bold colours in the illustrations, contrasting against the black background. The drawings seem simple yet the owl and other animal characters have so much expression. Everyone knows Owls are wise. But as well as being wise, I am a master of disguise. This book made me laugh! I really like the message behind this story about being confident in yourself and not giving up. It shows kids how setbacks can simply mean we need to try again. Hoot Owl’s creativity with the disguises was fun. I noticed that since the story is told in first person, there is no gender assigned to Hoot Owl, which might make for a nice topic of discussion. Discuss: Is Hoot Owl a boy or a girl? Does it matter? Draw your own animal superhero. This is definitely a book one needs to read more than once to catch all the nuances! The more I study it, the better it gets! Thanks for the recommendation. I look for all the things you mentioned--voice, repetition, language, humor. I am looking forward to reading this one. This story looks like a Hoot! Love the bold colors and humor! Haha! I love your sense of humor! You'll enjoy this one. Your review one me over. I'm going to pop over to my library's website and see if I can put this book on hold. This is one I will definitely be on the look-out for. Thanks Andrea. It's a great one for little ones. Though maybe a wee bit scary? A giant carrot! that is too funny! Definitely have to find this book to read for myself.